Barcelona broke a 27-year-old Spanish record by going 35 games unbeaten in all competitions with a 5-1 thrashing of nine-man Rayo Vallecano. Lionel Messi scored a hat-trick - his 35th - as the hosts fell apart after Ivan Rakitic's opener. Diego Llorente and Manuel Iturra were both dismissed for Rayo, whose only goal was scored by Manucho. Luis Suarez also had a penalty saved before Arda Turan completed the rout to move Barcelona eight points clear. Atletico are second in La Liga, with Zinedine Zidane's Real Madrid 12 points behind the leaders in third. Suarez's miss from the spot means Barcelona have failed to convert half of their 18 penalties this season. Messi has scored 33 goals this season and now has as many hat-tricks as Real Madrid rival Cristiano Ronaldo. "I'm pleased with how the season has progressed," said Enrique. "There is attitude, intensity and finishing. When Barca manages to be like that, you create danger from the first minute and it's hard to stop them." Match ends, Rayo Vallecano 1, Barcelona 5. 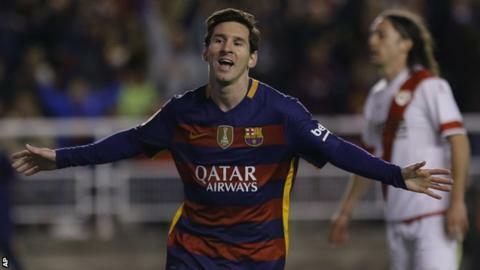 Second Half ends, Rayo Vallecano 1, Barcelona 5. Attempt missed. Tito (Rayo Vallecano) header from the centre of the box misses to the right. Attempt blocked. Joni Montiel (Rayo Vallecano) left footed shot from the right side of the box is blocked. Assisted by Adrián Embarba. Joni Montiel (Rayo Vallecano) wins a free kick on the right wing. Attempt saved. Adrián Embarba (Rayo Vallecano) right footed shot from outside the box is saved in the centre of the goal. Assisted by Javi Guerra. Neymar (Barcelona) is shown the yellow card for a bad foul. Antonio Amaya (Rayo Vallecano) wins a free kick in the defensive half. Goal! Rayo Vallecano 1, Barcelona 5. Arda Turan (Barcelona) header from the right side of the six yard box to the top right corner. Assisted by Jeremy Mathieu with a cross. Foul by Aleix Vidal (Barcelona). Javi Guerra (Rayo Vallecano) wins a free kick in the defensive half. Attempt missed. Luis Suárez (Barcelona) left footed shot from a difficult angle on the left misses to the right. Offside, Rayo Vallecano. Joni Montiel tries a through ball, but Adrián Embarba is caught offside. Substitution, Rayo Vallecano. Javi Guerra replaces Manucho. Offside, Rayo Vallecano. Roberto Trashorras tries a through ball, but Adrián Embarba is caught offside. Tito (Rayo Vallecano) wins a free kick on the left wing. Substitution, Barcelona. Aleix Vidal replaces Sergi Roberto. Goal! Rayo Vallecano 1, Barcelona 4. Lionel Messi (Barcelona) left footed shot from the centre of the box to the bottom right corner. Assisted by Sergio Busquets. Substitution, Rayo Vallecano. Antonio Amaya replaces Bebé. José Ángel Crespo (Rayo Vallecano) wins a free kick in the defensive half. Penalty saved! Luis Suárez (Barcelona) fails to capitalise on this great opportunity, right footed shot saved in the centre of the goal. Manuel Iturra (Rayo Vallecano) is shown the red card. Penalty conceded by Manuel Iturra (Rayo Vallecano) after a foul in the penalty area. Neymar (Barcelona) hits the bar with a right footed shot from outside the box from a direct free kick. Substitution, Barcelona. Arda Turan replaces Ivan Rakitic. Foul by Joni Montiel (Rayo Vallecano). Attempt saved. Luis Suárez (Barcelona) right footed shot from the centre of the box is saved in the centre of the goal. Assisted by Lionel Messi. Foul by José Ángel Crespo (Rayo Vallecano). Attempt missed. Lionel Messi (Barcelona) left footed shot from the centre of the box is too high. Assisted by Jeremy Mathieu.